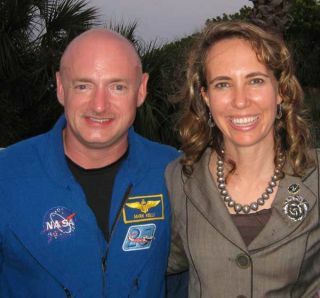 Astronaut Mark Kelly said yesterday (March 24) that there's a good chance his wife, wounded Congresswoman Gabrielle Giffords, will be able to attend his upcoming launch on the space shuttle Endeavour next month. "I've said on a few occasions that I'd like her to attend the launch," Kelly told reporters yesterday during a press conference at NASA's Johnson Space Center in Houston. "She wants to attend. And I think there's a pretty good chance that's going to happen. We still don't know for sure, and I'm just awaiting final approval from her doctors." Kelly said his wife, who has served as chairwoman of the House Space and Aeronautics Subcommittee, has long been planning to watch her husband blast off on Endeavour. "She's been looking forward to this for a long time," Kelly said. "As one of NASA's biggest supporters in Congress, she was really looking forward to having the opportunity to be there." By all accounts, Giffords has been making exceptional progress in her recovery, though the road is long and hard for such a serious injury. "She's doing remarkably well," Kelly said. "She's improving every day. She's starting to walk, talk more every day, and she's starting to process some of the tragedy that we all went though in January." Kelly and his identical twin brother Scott Kelly, who is also a NASA astronaut, have both attempted to draw a line between their personal and professional lives in the wake of the shooting. After his opening remarks yesterday, which included an update on his wife's condition, Kelly asked reporters to stick to questions about the space mission that was the topic of the briefing. He canceled the rest of his one-on-one interviews scheduled for the day out of concerns that the media would focus on Giffords and not on Endeavour's flight. The mission, STS-134, will be the last voyage for Endeavour and the second-to-last space shuttle flight ever before NASA retires its three-orbiter fleet this summer. Kelly and his crewmates are slated to deliver a $2 billion astrophysics experiment to the International Space Station that will hunt for energetic particles called cosmic rays. Endeavour's mission will also bring a vital load of spare supplies to the station to help outfit it for the era after the shuttles retire. You can follow SPACE.com senior writer Clara Moskowitz on Twitter @ClaraMoskowitz.Follow SPACE.com for the latest in space science and exploration news on Twitter @Spacedotcomand on Facebook.